In the past couple of years I've been learning more about food origins, local farming, Community Supported Agriculture (CSA) efforts and a group of eaters called Localvores. I have to admit that until recently I really didn't even acknowledge the difference between organic produce and commercially grown non organic produce. But my education is slowly and steadily increasing in this arena. While waiting for a flight about a year ago I was browsing the books at the airport and was drawn to Animal, Vegetable Miracle: A Year of Food Life by Barbara Kingsolver. I think it was the beautiful bright red and white swirled vegetables on the front that I couldn't even identify that piqued my interest. They turned out to be candy cane beets. I spent the next 4 hours on the plane learning about topics I didn't even know existed. If you are interested in learning about how the food you purchase in a local grocery store makes it from it's origin to your dinner table, you will get an earful. Barbara writes in detail about the cost of transporting food around the world--financial and environmental. You will also be educated about the history of farming in America and the current status of commodity farming versus local farming--a dying breed. Another dying breed is heirloom produce. Did you know that farmers pass their seeds down from generation to generation from previous years crops? I sure didn't. Big corporations have virtually monopolized the seed market through patenting efforts and genetic manipulation of seeds. Barbara Kingsolver also tells the tale of her own families commitment to strictly local food consumption for an entire year. Though I'm not ready for this type of extreme commitment, I am appreciative of the education and the effects it is having on the food choices in my life. Hubby and I make a point to visit the farmers market that goes on every Sunday just a few miles from our house. I find myself asking the vendors where their produce is grown...a question that never occurred to me before. Most of the food at our local farmers market makes a 160 mile journey to offer the members of our community an opportunity for fresh seasonal fruits and vegetables. I guess this is considered local when you live in an urban area. Though there are local farms much closer, I think the variety of products is limited. 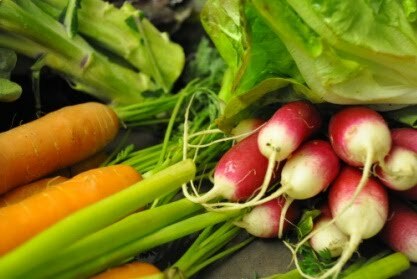 Not only do we frequent the farmers market, but we've also added Farm Fresh to You to our sources of fruits and veggies. 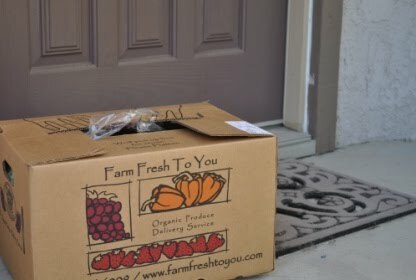 I'm not sure if Barbara would approve of Farm Fresh to You, because some of their produce has to travel the entire western seaboard to get to it's destination at my home in Orange County California. But it's a compromise that works for me. 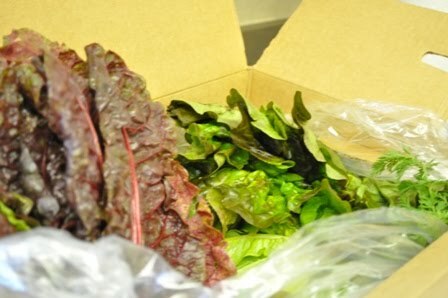 I'm getting deliveries of fresh seasonal organic produce every 3 weeks (you choose the frequency and size of the deliveries). On my delivery day I try to work from home and I admit I peek out the front door a few times as I anxiously wait for it to get here. Today they delivered about 5 hours later than normal and I was worried it wouldn't show. But at the end of my work day I finally got to bring in the box of goodies. The quality has been excellent. We get the regular mixed box for $31.50. 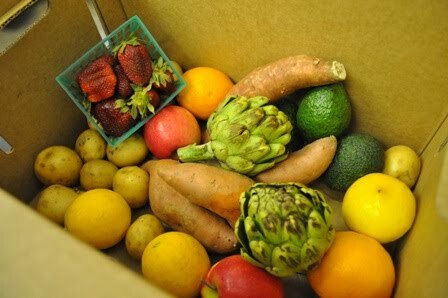 Today was my third delivery and I received 4 meyer lemons, 3 haas avocados, 2 pink lady apples, 2 baby artichokes, 2lbs of sweet potatoes, 2lbs small white potatoes, 1 navel orange, 1 minneola tangelo, 1 bunch of red radishes, 1 bunch of chard, 1 bunch of loose carrots, 1 bunch of spring onions, 1 head of green leaf lettuce, 1 head of brocoli, 1/2 lb of mixed baby lettuce and 1 pint of strawberries. Basically they send different items each time...whatever is fresh. You can log on to their website the Friday before your delivery day to see what's coming. If you see something that scares you, your allergic to or you just plain don't like, you can add it to your exclusion list. They will sub out something else (a fruit for a fruit and a veggie for a veggie). You don't get to pick the substitution product if you go online, but you can call FFTY customer service they will make a note. This time I placed kale on the exclusion list... I don't think I'm ready for that yet. In its place I got white potatoes. The part I'm enjoying the most is the variety of fruits and vegetables. The box has contained things that I have never cooked with before. Eaten? Maybe. A few things new to my kitchen were beets, leeks and swiss chard. I made a leek and swiss card quiche several weeks back that turned out pretty tasty. Unfortunately Hubby was not in total agreement. I think it was the swiss chard that threw him for a loop. I have some arm twisting to do for him to adopt this leafy green. 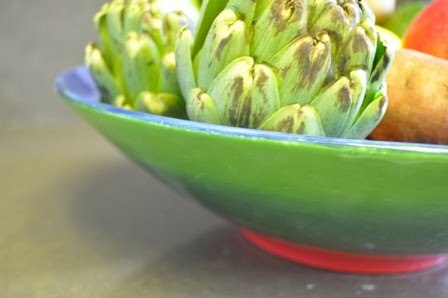 This go round I'm going to give artichokes a try for the first time. I'm in search of a good grilled artichoke recipe. I'm also going to use my broccoli to try out Carolyn's Broccoli Casserole. Hopefully these will be the subjects of future posts. 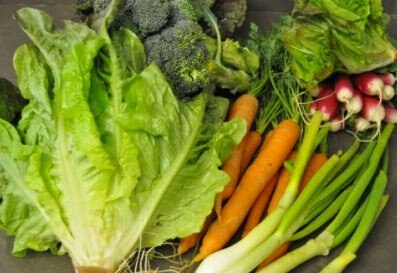 As summer approaches I look foward to an array of delicious, fresh, fruits and veggies to cook, eat, enjoy and of course, blog about!